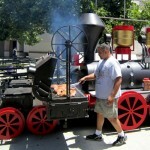 P Train’s BBQ grill and smoker train is the epitome of functional art. Not only is the Klose BBQ Pit’s built train a one of a kind visual delight, it also serves up the tastiest slow cooked meats, smoked pizza’s and grilled hot wings you’ll ever eat from the belly of a train. 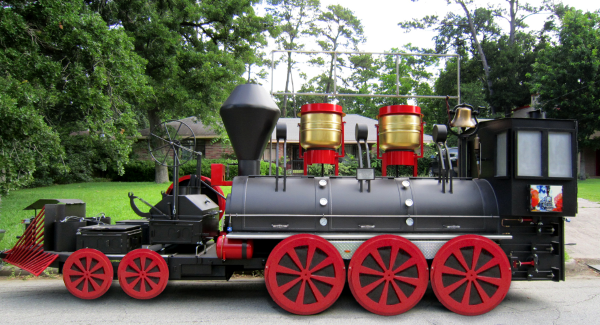 So how did we end up with a BBQ Grill and Smoker that looks like a train? P Train’s signature train was first inspired by a famous train, the train at Disneyland. The Disneyland train is a staple for all Southern California locals and while watching it pull into the station during a visit with his family, it struck Pat that this would be an awesome style to make into a BBQ Grill and Smoker. While both trains have the same 1850’s styling, that is where the similarities end. Here are some fun facts about P Train’s BBQ train. P Train’s Smoking Train is designed to look like an 1850’s steam train, the train is 24’ long, 8’ wide and the smoke stack stands at 10’ tall. The train which weighs 10,500 lbs was built on top of a 3 axle trailer so that it could be pulled to events. It has two 25 gallon water tanks on top which supply on demand water to the two stainless steel sinks on the back. The train has a working 350 watt headlight and a working 100 year old train bell. An air compressor fills two red tanks at the front which power the genuine air whistle. At the front of the train there is a 4’X2’ pull-out grill, the main body of the train is a 10’X3’ smoking chamber for slow cooked meats like Tri-Tip and prime rib. The back of the train is a one of a kind smoke pizza oven powered by real wood and gas. Finally we have two burner/griddles for cooking corn, beans, fish fry, deep fried turkey, etc. The train can feed up to 1,500 people in one sitting. So the next time you hear “P Train’s California BBQ has a Smoking Train” you’ll know it’s not just a smoking hot looking train, but an actual Smoking Train! A train shaped BBQ that we use to smoke select Tri-Tip, BBQ Ribs, California Style Grilled Hot Wings and our Special Smoked Pizza. Want to see the P Train’s California BBQ Train in action? Visit our Event page to find out where you can board the flavor train! P Train’s California BBQ Has Arrived – All Aboard!